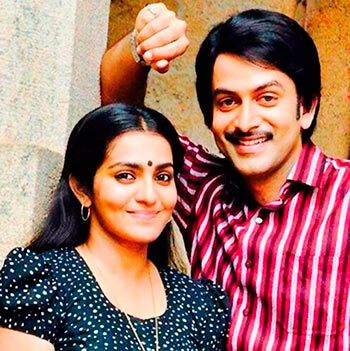 Ennu Ninte Moideen is a worthwhile effort that we can savour, says Paresh C Palicha. It is believed that tragic love stories linger in our minds longer than happy ones. Debutante director R S Vimal seems to be aware of this fact; his Ennu Ninte Moideen is inspired from a real life love story with a not-so-happy narrative. Based in an era when even talking to a spouse in the presence of elders was scorned, the film is about two rebellious youngsters from different religions who fall in love. Ennu Ninte Moideen tells the story of Moideen (Prithviraj) and Kanchanamala (Parvathy), who are friends before cupid strikes. Moideen is a zealous youth, wearing socialist ideals on his sleeves while his father (Sai Kumar) is a staunch Congressman, which gives the director a chance to include some comical conflicts. On the other hand, Kanchanamala is shown to be leading a revolt against hostel management for the disparity in the quality of food given to the students according to their economic status. Emotions and voilence intensify as the story progresses but the leads keep things entertaining with their clever banter. The director claims he did not take any cinematic liberties as the story itself was very interesting. Prithviraj succeeds in giving Moideen’s character a larger than life aura yet displays the vulnerability of a lost lover in private. It's all smooth sailing for Parvathy as the feisty Kanchanamala. Jomon T John’s camerawork provides the gloomy ambience for the doomed love story capturing the cloudy sky when the action is outdoors or shooting indoors with pale lightings. Ennu Ninte Moideen is a worthwhile effort..